1) What was it which first drew your attention to this particular era and the events which were taking place at that time? Was it your interest in the silver market, or is it your studies of this period which led you to become so bullish toward the silver market? I did a multi-part series called “Britain Against Silver,” tallying over 324,000 words, which ran at Silver Investor site, beginning in August 2007. I researched England’s activities globally against silver, using as reference resources The Times, London; the New York Times; Commercial & Financial Chronicle; Mining Congress Journal; China Weekly Review and many others. 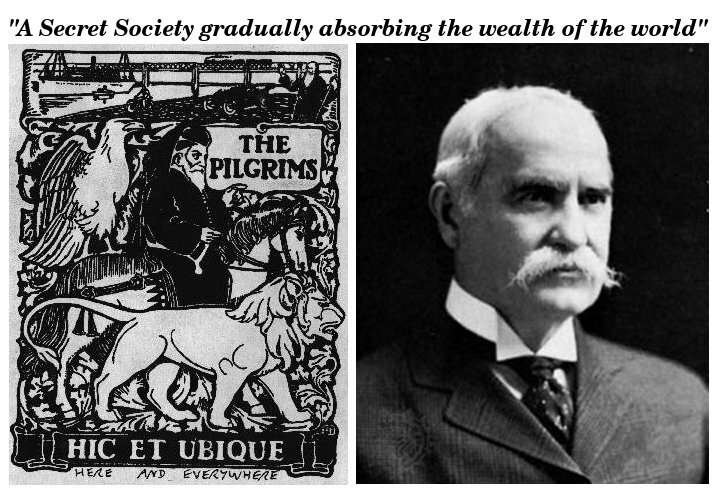 The organization is sponsored by the British Crown and drew into itself heirs of fortunes from the centuries old worldwide British Empire and the prominent North American “robber barons” of the 19th century—Rockefellers; Mellons; DuPonts; Astors; Vanderbilts and many others. Both branches feature roughly 700 unidentified persons each—diplomats, ambassadors, admirals, generals, chairmen of mega-banks and large corporations, corporate and banking directors, trustees of major universities, foundations, research institutions and organizations of every description—and high U.S. and U.K. government officials, and some highly placed Canadians. My deduction is by hereditary and marriage situations and men who can influence events at a high level are invited—key Ambassadors, generals, admirals, high government officials, Wall Street attorneys, corporation chairmen, megabank execs, managers of “think-tanks,” and large non-managerial shareholders. Documentation of their existence is profuse enough; read The Silver Stealers. Enter on Google images “Pilgrims Society” or click on www.pilgrimsociety.org Those with hundreds of hours of free time may care to start reviewing dozens of old Who’s Who volumes. However, I have already done this and concentrated the data. Silver represents monetary wealth outside their immediate control; they prefer investors to get into scams such as Iraqi dinars, or anything else unsound, in order to impoverish them. Poor folks are easier to control than those of means. Few economics texts even mention silver currency; they are content to have the public view silver merely as jewelry—preferably purchased from either of the two jewelry concerns currently members of the Silver Users Association! Based on their founding year of 1902, the following—in British India, it would be the continuation of the closure of the mints to free coinage of silver rupees; in America, it would be the Panic of 1907, managed mainly by the Morgan interests to scare the public as a tactic to lobby for a central bank, which we hadn’t had since 1836! The elite had advance warning as to Federal Reserve policies which intentionally caused the October ’29 crash. But it did not cause mass unemployment. The loss of exports to the Far East was the cause. They couldn’t pay because England depressed the value of their silver money! Absolutely I’m concerned; that’s why I created “The Silver Stealers” documentary; also in June 2009 I released at Silver Investor, “Precious Metals Confiscation—Facts And Prospects,” a 312 page presentation straight from the pages of the Commercial & Financial Chronicle, the New York Times and various other public record sources. I own mining shares in a top tier company and several juniors plus hard stuff—100 ounce bars being the largest; 50’s, 10’s, 5’s, 2 ounce, one ounce, half ounce, and 90% coins. I acquired no numismatic coins except semi-scarce dates in nice condition when I could get them for the same rate as the commonest strikes. I recognize the flexibility of holding silver in the smallest units—dimes. My emphasis is on silver over gold as the price ratio is so wrong against silver. Great article! And I did a quick scan of “The Silver Stealers” as well, which had some truly incredible quotes about the suffering & suicides in the US caused by the Silver Demonetization Act of 1873. “The Silver Stealers” (& this article) are a timely & excellent compliment to the book I am just now reading titled, The Coming Battle (written in 1899, which Savoie cites as well). There is LOTS of interesting information tucked into “The Silver Stealers” along with the direct “conspiracy” materials about The Pilgrims. For example, during World War II, the United States suddenly SHUT DOWN all the gold mines in the U.S. – claiming that they were using up too much “materials” which the U.S. supposedly needed for the war effort. Public awareness can disrupt injurious plans in the works—like attacking a tumor. Thanks to all helping spread it around. This is a public service effort for which I receive no income. See the link below for historical silver prices. The chart’s scale is not as accurate as we might want; however, it shows a spike at app. 1919, while for every other year before and after (up until app. 1945), the price barely registers. There is a big drop-off right after 1919, and the price decreases gradually to what could be 1931. Since Savoie claims the rupee-melting began in 1926 at the earliest (six years after 1919), I see no cause and effect to his assertions whatsoever. Therefore, his supposition that this was the sole cause of the Great Depression is of dubious veracity. In fact the global monetary conspirators of The Pilgrims Society have always sought to attack silver from as many angles as possible. Has this Paladin, not to be confused with the hero played by Richard Boone, read The Silver Stealers? Multiple sources at the time, including the Vancouver Sun and China Weekly Review, blamed Great Britain’s Indian silver dumping for the worldwide loss of jobs.